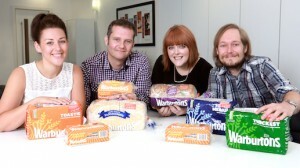 RMS PR has been appointed by Warburtons following a 7-way competitive pitch. The Altrincham agency won the public relations brief to revamp and relaunch “W” the firm’s internal magazine. It will also be designing and developing a microsite and mobile app. “Warburtons is the second biggest grocery brand in the UK and our appointment is testament to the quality of our consumer PR team and in-house creative, design and digital departments,” said RMS managing director, Ruth Shearn. Consumer account director, Caroline Eardley will lead the account, supported by lead creative, Andrew Avery; account executive Rachel Leamon; and head of digital Alastair Fallon. “RMS demonstrated a thorough understanding of our communications objectives and presented some excellent ideas and creative work,” added Tearmh France, corporate and internal communications manager at Warburtons.